I’d had a long 24 hours. I was at Pushkar. I had to come out of my den and catch the Ranikhet Express to reach Rudrapur at an unearthly hour of 3 AM, followed by a early morning bus to Tanakpur, and then a shared car to Champawat. At around 10 AM, I was 15 KMs away from my destination. All this while I had been battling flu-like symptoms and I was not sure what exactly was happening to me. All I knew was that I will need a good siesta once I reach. However, the traffic came to a standstill after that point. A large rock had fallen from the top and positioned it miraculously on the road, instead of tumbling down further. Hundreds of vehicles had gathered at that point on both sides of the rock. For the next 8 hours, all I could do was to watch the excavators work tirelessly to dig out a road bypassing the rock because it was too big to move. I have been in trickier situations such as when I got stuck at 4400 meters and when I had to spend a lonely night at the jungle but combined with illness, it turned out to be a serious ordeal that day. Anyway, the road finally cleared at around 6 pm and I reached Champawat by 7 pm, and went directly to attend a meeting, which was a part of the program I was invited to attend. I could finally retire for the day only after 11 PM. Sorry for the tedious beginning but this is also to point out how difficult it can get in these regions. Champawat is a place that does not easily ring a bell, which is surprising because it used to be the capital of Kumaon Kingdom, an ancient town with mythological associations as well as archaeological remains. When I first saw the invitation to visit the place, I had to think hard and finally remembered a Corbett story called the Champawat tiger. Apart from that, I could hardly find anything about the place. This is because this Tanakpur-Champawat-Pithoragarh route is the easternmost and least visited part of Kumaon. It is not far from the Nepal border and feels a bit different compared to the rest of the state. Anyway, this is why I accepted this opportunity to visit and explored the place. So, the primary thrust of me being here was Uttarakhand Sustainable Development Festival. It was being organized by NGOs International Centre for Sustainable Development and The Dais Foundation, primarily managed by youngsters. But it was good to see that they had full support of the district administration in the process. The scope of the discussion was not limited to tourism but covered everything from education to agriculture. However, since I was there as a travel writer, I am focusing on the tourism part. I hope this will bridge the information gap that exists right now between Champawat and its potential visitors. During the conference, the also launched an ecommece shop for Champawat where once can buy local produces such as Red Rice and Organic Tea. For the next few days, I participated in many activities, some organized by my hosts, some on my own. Instead of providing a day by day account, I am segregating my experience in a topical manner so that everyone can understand what Champawat has to offer. Champawat itself is a small but busy town. If you just pass through the market around the highway, you will probably not realize what the town has to offer. It actually has a very unique geography and it can only be understood if you walk around a bit. Narrow but fertile valleys are spread on all directions, till they reach the higher mountains. It was February, so the landscape was reddish brown. I guess it looks better in the monsoons. Nevertheless, the spring was already beginning to show its colors. Especially pear trees were flowering already. It some manners, it reminded me of Karsog in Himachal. The most prominent buildings in town are the government buildings and if you just try hard enough, you can capture the same through some interesting vantage points. Uttarakahnd is one of the lesser-known tea growing areas of India with a long history. Tea plantation started in Kumaon more than 150 years ago, almost at the same time as some other major tea producing areas of India. It also enjoyed a brief period of prosperity in the middle of the 20th century but due to increasing production cost and some other issues it gradually lost its market. However, the efforts are now on to revive the same and Champawat remains one of the major tea growing areas in the state. Desmond Birkbeck and his family was the host for the day for the delegates of the conference who were being given a tour of the tea gardens. Desmond’s family has been involved in this trade for several generations and working with the Uttarakhand Tea Board to revive the fortunes of Kumaoni tea. However, even before a hike through the tea gardens, we got a chance to explore the estate of the family, that is more like a agricultural utopia for mountain lovers. Blooming mustard fields, peaches, pears, malta (a citrus fruit) trees bending over with the weight of ripe fruits were enough make the delegates delirious. Everyone was treated with pancakes homemade jams from the fruits from the farm and of course, local tea. Later one, we did take that hike through the tea garden. Such walks are not new to me but occasional rhododendrons, which seemed to be blooming a bit too early in February, was a surprise addition to the garden. As I have mentioned before, Champawat was once the capital of Kumaon Kingdom. There are several ancient temples spread around the district. While I could not visit them all, I managed to visit the Baleshwar Mahadev temple, one of the most elaborate temples I have come across in the hills. According to ASI, this group of temple was constructed in the 14th Century by the Chand rulers. I have seen many medieval temples in Himachal and Uttarakhand but this one is unique because the unique structure. Also, there are hundreds of sculptures scattered around the complex. They reminded me of some places in Rajasthan and Madhya Pradesh and I definitely beyond my expectations. There is also a “Naula”, a traditional water structure near the temple. It is built below the ground level and the water oozing from the ground is collected. Another site that I could not visit in town is called the Chabutra. It is a highly ornamented structure with a Chatri. The exact purpose of the Chabutra is not known. Lohaghat is another town, just 13 Kms ahead of Champawat, which is the base for two important attractions in this region, Abbott Mount and Mayavati Ashram. I managed to visit both as I skipped one meeting and set out with a couple of other guys I’d befriended at the conference. However, my trip was not as satisfactory as it should have been. Abbott Mount is around 7-8 Kms ahead of Lohaghat, followed by a short hike to the hilltop. The primary attraction here is the great 360 degree view of the snowy peaks that it provides on a clear day. Sadly, that also means that it is completely dependent on the weather. The day I went was a strange day. It was a sunny day but the sky was dull and somewhat hazy. Not a single peak was visible in the horizon. Maybe this is why the dry and dusty spring is considered an off-season in these parts. Apart from the peaks, Abbott Mount has a few graves and a piratically abandoned church that can help conspiracy theorists to concoct one of those haunted house stories. Actually, the place is named so because of the Abbott family who tried to settle here. They are the ones who now rest under those graves. We returned to Lohaghat quickly, by taking lift on a truck. Mayawati Ashram is around 8 KMs but there was no public transport available. We finally hired a guy, who ran a garage by the side of the road, to take us there and drop us back. He charged INR 400. I would not have done it alone but it got divided between three people so it was tolerable. It was a nice drive through pine and rhododendron forests and we reached in quick time. This Ashram was envisioned by Swami Vivekananda and built by a couple of British disciples of his. It is a beautiful compound but sadly photography is not allowed inside. We met Swami Narasimhananda, who is the editor of the magazine published from here. In fact,this has been a major publishing center for more than a century now. We also saw an old printing machine that has been preserved for everyone to see. We had a good conversation with Swamiji. Somehow he asked if I was a blogger (no one in my family has ever got that right). So, I guess the power spirituality is not to be underestimated. So, I spent around 5 days in Champawat and then left for pithoragarh, which is higher up in the mountains. I am aware of the confusing tone of this article but that was because I was trying to cover several aspects of the place. The conference of sustainability is a good initiative and I hope they continue the work. What I could understand is that this region, just like most other Himalayan regions, is a fertile stretch with a lot of potential in terms of agribusinesses and tourism. As of now not too many people are visiting it but I can see that improving in the next few years. One thing that can help this process is better availability of information, and development of affordable homestays in various strategic parts of the region. I don’t know about the later but I can take care of the former through this guide below. The best way to reach Champawat is via Tanakpur , which is one of the lesser-known rail stations in Uttarakhand. It is actually not far from Nepal Border. Unfortunately, it does not have any direct connectivity with Delhi but is connected to larger cities of UP. 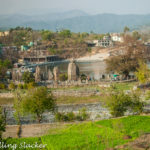 Easier way is to take a train to Rudrapur (Delhi-Haldwani route), bus to Tanakpur, and then a shared car to Champawat which is around 75 KMs away from there. Where to stay in Champawat? There are at least a dozen low to mid-range hotels in the town with decent facilities. I am not aware of any homestays or fancy resorts as of now. What to see in Champawat? Mayavati Ashram (22 KMs via Lohaghat, preserved memories of Vivekananda and a good place to meditate but you will have to book in advance if you want to stay in the ashram). Tea Gardens and Farms around the town. You will need a local guide to find them though. Pancheshwar (52 KMs from Champawat, a small town with a temple in the Nepal border. Great views of the confluence of rivers Sharda and Kali). Phone and data connectivity in Champawat? Most major connections should work but the signal strength may fluctuate at times. There are wine shops in the market although the availability of particular brands could not be ascertained. Where to go after Champawat? This is only the beginning. After this you can move on northwards to Pithoragarh-Dharchula-Munsiyari circuit. Nice to read about Champawat, Amazing place . Very informative post. Thanks a lot for pics. Wow, your journey to Champawat really was an ordeal, I would have struggled even if I was not ill let alone with a touch of the flu. Enjoyed reading about the Uttarakhand Sustainable Development Festival, and that it covered everything from agriculture to tourism to education. Champawat is not a place I would have thought to visit but looks like you had a really interesting experience and I know I would enjoy visiting tea and fruit farms in particular. A hike through the tea garden and a delicious meal of pancakes and fruits afterward sounds like an amazing way to spend the day and at the same time understand the local tea plantation. The temples and the archeological remains looks very interesting too. So cool that you were able to visit some temples on your visit. Btw love the pictures of the temples…would be really nice to go back and learn more about them! Getting sick while traveling is never fun, but to have a boulder block your way is crazy. The sculptures at the Baleshwar Temple are gorgeous. It seems like the area is working to improve tourism and I think that over time they will because it looks like a great place to visit. Even after your slow start, Champawat looks like an incredible place to see. Baleshwar Temple is a highlight, but you are right to point out how remote and difficult some of these places can be especially if a boulder lands in your way! I love the idea of a hike through the tea gardens! Now this sounds like an adventure. I’ve never had a giant boulder block my road before. That’s insane! I would love to see Baleshwar Temple myself. I’m a huge fan of both nature and temples. What a remote and stunning destination. This is such a lovely discovery. I loved the small town feel with all those terrace farms and the rhododendrons. However, it is the heritage part that got me intrigued. Such amazing art and in a fairly decent state. I can see how this place must have helped you recover from the bad health and start you had. Beautiful write up and pictures . Your post unveils Champawat and its history as the place is definitely not much known. When I started reading I had a vague memory of having read about it but it did not ring a bell otherwise. But it became a little more clear after reading about the Corbett connection. I never knew that Champawat was the capital of the Kumaon Kingdom. It is heartening to note that the authorities are taking steps for the sustainable development of the region. I found the old temples really fascinating and hope to get there someday to explore the same. After reading your post; now I know what I have missed. Champawat looks great and your pictures are amazing. 360 degree views from the hill top will be simply gorgeous. Boy you really had a tough time reaching there. I have never heard of Champawat and I was actually living in Uttrakhand for a couple of years when my dad was in the Indian Armed Forces. It does sound like it would’ve been a great place to visit. The tea gardens, the farms, the temples and archaeological remains, they all look absolutely lovely! Thanks for this informative post, I’ve learned about a new place today!